Features a heavy duty cable clamp with a 5-pin female plug. Features a black metal shell and contains gold-plated contacts. 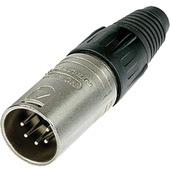 5-pin female XLR connector that is designed for panel mounting. Features gold-plated contacts and nickel housing. Improves contact integrity as well cable strain relief. 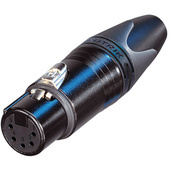 XLR connector for soldered terminations of five-conductor cables.